I can’t sleep, I am working nights this week, and should sleep days, but sometimes it just doesn’t take. I meander about the house, then it comes to me, I need to ride. 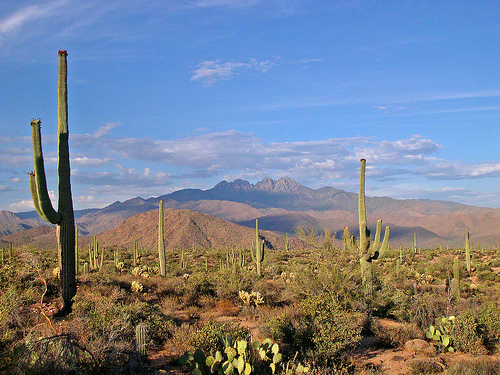 It is 112 degrees or so outside, but hey, I am used to it, I saddle up my bicycle and head out into the heat, headed for my mountain trail. I have my camelback full of water, and a bottle extra, I will be fine. As I hit the trailhead near my home, I think to myself that it is hotter than usual, but I am comforted by the water on my back, and the fact that I have ridden this trail a hundred times or so in the last six months. I power up the first part, the mountain known as lung buster hill until I reach the saddle and have a choice, go left and be done with the ride soon, or take the four mile uphill trail to my right and tough it out. I go right. If I get a flat, it doesn’t matter whether I have a spare tube, I have no means to air it up. My water supply is based on a quick trip through the mountains, not on having to walk out. The desert southwest is full of stories of hikers who have gotten into trouble and died from exposure before they could get to help, I am one flat tire from being that guy. I finish the trail, get back on the road that leads to my home, and finish the ride with no incident. I find my bike pump in the garage where my bike resides, I don’t remember taking it off, but I guess I did. This is a parable of sorts, based loosely on truth, the ride was real, but I only wondered what it would be like had I lost my pump. Being ADD, it is common for me to lose track of things that are important, like reading the Bible daily, like spending much time in prayer. These things are easy to remember when life is good, when there are no bumps or flat tires. When life gets hectic, when we are forced into working more, spreading ourselves thin and we allow ourselves to be overwhelmed, what suffers? For me it has been my daily Bible reading, for me it has been the deep time spent in prayer to my Lord and Savior, and for me, they are my spare tire and bike pump that will get me through the desert in life. Without them, I am nothing less than a skeleton under cactus, a victim scattered by the buzzards. Summers are always tougher for me, for reasons I cannot explain. For some reason, I always seem to get overwhelmed, and the things that are so important to me take the back burner. A very dear friend and brother in Christ was called home this week, and I am dealing with his affairs with his widow, and need to give the eulogy at his memorial. I feel so empty inside, as his loss was unexpected. This is a time when it would have been better if I was steeped in the word, but I had allowed it to take a back burner. This is a time when it would have been better if my prayer life had been better, but it too had taken a back seat to other things in my life. Had I not let them slip back, they would have been the cool waters that soothed me through the long walk in the desert; they may have been the pump that buoyed my tires back to life. Remember friends, the Bible and its regular reading gives us strength that we need to power through the desert of life. 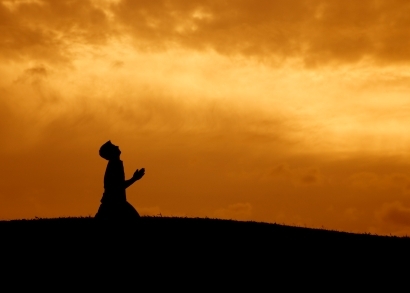 Prayer is the life giving fluid that will refresh us and give us the strength we need to make it back home. If they are not front and center always, then you will one day be stranded in the desert of life. She was in the corner on her knees facing the wall, her body shaking and heaving with each sob. I couldn’t help but glance over at her after I had prayed with a man whose wife had just filed for divorce. After he stood, I told him he was welcome to stay as long as he would like, and he shook his head and nodded toward the woman. Someone needs help more than I do. After he left, she rose and walked toward me as I greeted her and asked her if there was something I could pray with her about. She glanced nervously out through the large glass windows that overlook our overflow room at church. When someone would walk by she would quickly turn her head away and down so that she could not be seen. She was constantly shaking and sobbing, and I must admit I cannot remember a time when I felt more helpless. As I tried to talk to her, she kept looking over her shoulder to make sure no-one she knew had noticed her in this room. She was desperate, her marriage of twenty five years was in danger, she had lost a job, and they were foundering financially. Her husband held her responsible for their financial woes, and she was at the end of her rope. As she recalled the story over and over again in rapid fire desperation, her demeanor was that of a wounded animal, and my heart was filled with compassion. She then told me that she had gone to church here for twenty years, and knew a lot of people, but in a church our size, you can still get lost in the crowd. The reason she kept looking over her shoulder was because she was afraid someone she knew would see her in the prayer room and tell her husband. I tried to encourage her that it doesn’t matter what people think, it only matters what God thinks, but she found no solace in my assurances. She was desperate for spiritual rescue, yet afraid someone would see her in her weakness and think less of her, and pass that on to her spouse. She went on to detail that she wanted to go to counseling because they were going through this hard time, and her husband told her that they would not be baring their dirty laundry to anyone, they would settle it on their own. She would not even tell me her first name, so I did the best thing I knew how to do, pray. We prayed for her family for all they hard times they were experiencing. We prayed that God would mend their family and give her the peace and comfort that surpasses all understanding, the peace that only Jesus Christ can provide. As I closed with Amen, she turned without another word and left out the door immediately blending with the crowd further down the way, once again lost in anonymity. Almost…. The One who counts knows her name, and she will never be anonymous to Him. As I left and went home, I felt really troubled by the experience though. God is my strength, He is my shelter, and I know I can always go to Him and find refuge. But the church should also be a refuge. The people of the church, not the building. I cannot fathom feeling so desperate and afraid of my fellow followers of Christ. I know there are other issues at play here, but I believe we all need to have a “safe place” to go to where we will be loved and not be judged. In the song Stained Glass Masquerade by Casting Crowns I feel the same message being proclaimed. I guess the question is, is church a “safe place” for you? Do you make it a safe place for others?